Hey there, so you’re here looking for a comparison between Wix and Strikingly? Well, you’ve come to the right place, my digital friend! I’ve pitted these two websites builders against each other in a number of different areas everything from their ease of use to their pricing and just about everything in-between. Just before we get into the “nitty-gritty”, there’s one thing that sets these two popular website builders apart right from the outset. It could make your decision a little easier and possibly save you from having to read the whole comparison! Wix and Strikingly are both solid platforms yet quite different. Your choice depends entirely on what you want to achieve with your new website. Wix is one of the most versatile website builders on the market and you can create just about any type of site from a small personal blog to a full-blown business website. Strikingly, on the other hand, have carved themselves a nice little niche by focusing on the newer style, one-page style sites that seem to be growing in popularity by the day. If you haven’t seen them, they contain all of the main information on a single page that users can scroll down rather than having to flick from page to page. Well, if I was in your position right now, and I was planning to build a site with multiple pages, lots of high-quality images, and required plenty of business functionality, I’d choose Wix (try Wix for free here). On the other hand, if it’s a stylish, modern, albeit simpler project you have in mind and you won’t be needing all of the”bells & whistles” that Wix offers, then Strikingly provides a more streamlined solution which could be just what you’re looking for (try Strikingly for free). For those of you that are still here, let’s start dismantling these platforms pieces by piece! 1. Who Has The Best Design Templates? 2. Which Is The Easiest To Use? 4. Are They Both Mobile Friendly? 5. Wix vs Strikingly For an Online Shop? 6. Which Has The Best Blogging Platform? Wix has some beautiful templates and they’re divided into categories including business, photography, portfolios, events, health & wellness, fashion & beauty, the list continues. When you click on a category, you’re able to drill down even further. For example, I dived into the business category and was met with 12 pages of templates such as salons, architects, law firms, cleaning services, and removal companies. All of Wix’s 500+ designs come with sample text, images, and industry relevant pages which you can start editing and customizing to suit your needs. Strikingly doesn’t have quite as many. In fact, you only have a choice of 28 split up into business, startups, personal sites, blogs, and online stores. That may not sound like many in comparison (and it isn’t) but when I reviewed Strikingly, I started off with a healthy eating template and quickly transformed it into a fictional yoga business website. Similarly, in my last article, I was looking for the best website builders for a church website. I actually started out with a restaurant theme as I liked the look of it. I ripped out the menu, changed the text and images and within 30 minutes, the site looked unrecognizable from what I started with. Wix is the more daunting of the two when you first enter the website editor. This is due to the wide array of tools you have at your disposal to help you create and customize your website. However, each of those tools has a little information button that explains exactly what it does and you’ll soon be dragging and dropping your text and images around the page. As Strikingly focuses on helping you create a simpler type of website, everything feels more streamlined and you won’t be inundated with tools as everything’s neatly organized in the main menu on the left-hand side of the screen. To be honest, I thought I’d get a frustrated not having as much freedom as with Wix but I can honestly say, I didn’t miss it. Ease of use summary: Both Wix and Strikingly are perfect for beginners although it may take you a little longer to adjust to Wix. Strikingly offers a simpler website building experience. In the last round, Strikingly beat Wix in a photo finish but when it comes to features, there’s a clear winner. 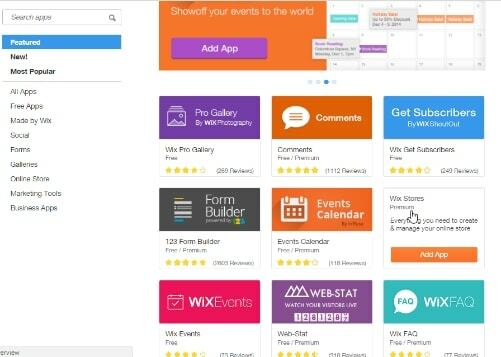 Wix has an app store which is home to over 260 add-on features to help you build and mold your website. All of which can be installed on your site with a single click! Inside, you’ll find everything from appointment scheduling tools, gallery’s, visitor stats, invoicing software, music players, live chat feature, restaurant reservations, hotel bookings, and we’re only just scratching the surface. I should point out that while many of them are created by Wix, others are from third-party developers meaning if the company disappears, so will their app. Some are free, some have a free trial, others have a free and premium version available which you can pay to unlock the more advanced features of that particular app. Strikingly allows you to add basic features such as a gallery and integrate your social profiles through their main editor. They also have an app store albeit on a smaller scaler than Wix. Inside, you’ll find Google Maps to help people find you, PayPal buttons to accept payments or donations, form builders to create quote forms & surveys, and a calendar which you can share with your visitors. Most of these features are free but a couple of them are only available with strikingly’s Pro plan. Features summary: The clear winner here is Wix but it’s important to remember that when using Strikingly to create a one-page website, you’ll need fewer features and they’ve done a great job of simplifying their tools for speed and user experience. Wix allows you to get inside to customize the look and layout of your mobile site and your desktop site will remain unchanged. Personally, I prefer to have this feature as more people are browsing the internet with smartphones and tablets, it’s good to be able to offer them a unique experience. With Strikingly, you create your main website and that it, you’re done. It’ll work perfectly on all mobile devices. Both Wix and Strikingly offer a cool feature that’s usually overlooked by most website builders and is especially important if you’re a local business. This bar contains information such as a map icon, email, and a phone icon that once tapped, allows the user to call you directly which can only lead to increased conversions. Mobile summary: Your website will look great on all mobile devices regardless of which platform you choose. Wix allows you to customize the look and layout but Strikingly’s single page design possibly makes for a better all-around mobile experience. Wix is a strong contender for anyone looking to create a small online store. Wix’s store look good and it’s easy to set up and manage but they don’t allow you to import or export products from a spreadsheet. This means you’ll spend a lot of time writing titles, adding descriptions etc if you have a lot of products and you’ll have to do it all over again should you decide to move your store down the line to another platform. This means Wix is better suited to smaller stores. 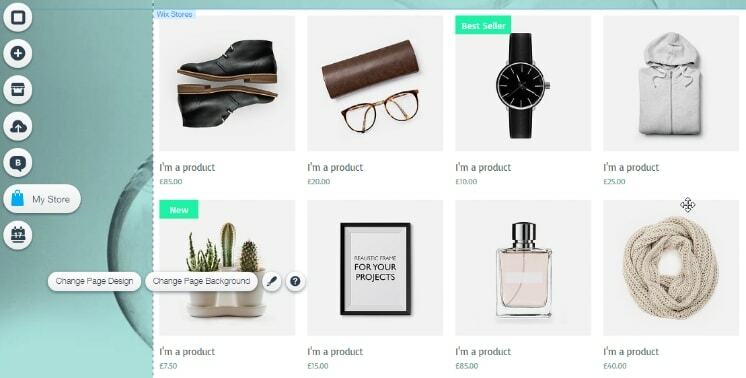 Strikingly offers the “Simple Store” which allows you to sell up to 300 products, add product variants, create customer discount codes, and offer flexible payment options. When I created my yoga website (for testing), I added a store to sell yoga mats and other related products. I think strikingly’s store works perfectly in this scenario, but it wouldn’t be my first choice if eCommerce was my main focus. Online store summary: Wix has the most powerful eCommerce tools and is a strong contender for a small, stand-alone store. Strikingly’s Simple Store has fewer features and would make for a great addition to your site if you’re only looking to sell a handful of products. Wix has a strong blogging platform to help you get the word out about your website. You can add images, video, integrate social buttons so people can share your content, schedule posts to automatically publish at a later date, and stay organized by assigning posts with categories and tags. Strikingly offers what they call the “Simple Blog” and as you’d expect because of the name, it doesn’t have quite as many features as Wix. Two features it’s missing off the top of my head is the ability to schedule posts and add tags. Still, it’s easy to get to grips with and would make a good choice for the occasional blogger. Blogging summary: Again, Wix is stronger in this area. Strikingly’s blog also has many of the main features you’d expect but I can’t help but feel it’d be better as an integration to your site rather than a standalone blog. 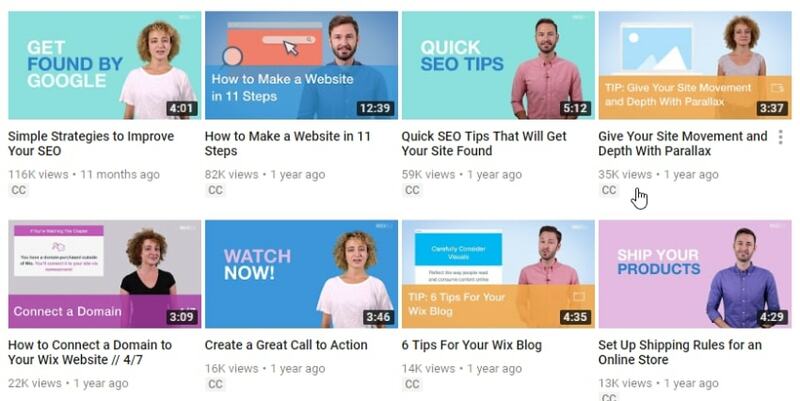 The first thing to note is, both Wix and Strikingly have plenty of written tutorials and video walkthroughs that may just prove invaluable when getting your head around the basics. Should you run into a technical or billing issue, then you’ll need to speak to the support teams. I’ve received fantastic support from Wix in the past but I have to say, the last time I had a question I did have to hunt to find their contact details. In the first instance, they tend to push you into their knowledge base to browse the tutorials and previously asked questions. If you still can’t find what you’re looking for, you’ll (eventually) come across the contact options where you can get in touch via email or request a callback from a member of the team. Strikingly have “Happiness Officers” who provide support by way of live chat for instant help, or email for less urgent enquires. I’ve tried both channels and on both occasions, the officers couldn’t do enough to make sure that my problem was resolved. A refreshing experience! Support summary: I’ve always been very satisfied with the help that I’ve received from Wix and Strikingly customer services. Wix encourages you to find the answer in their knowledge base before offering their contact details which can be a little frustrating. 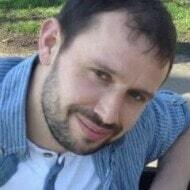 The Strikingly team feel more approachable and go out of their way to help. The good news is Wix and Striking both offer a free plan which you can continue on for as long as you wish. However, you will have ads displayed on your site and you’ll find many features restricted (more so with Strikingly). Actually, the same applies to both of their cheapest premium plans which is far from ideal and something I’d personally like to see changed. *Note: The prices shown below are based on an annual plan which is billed upfront. Both providers also offer month-to-month as well as 2-year plans. Wix’s premium plans start at $5/month and go up to $25 per month depending on your requirements. 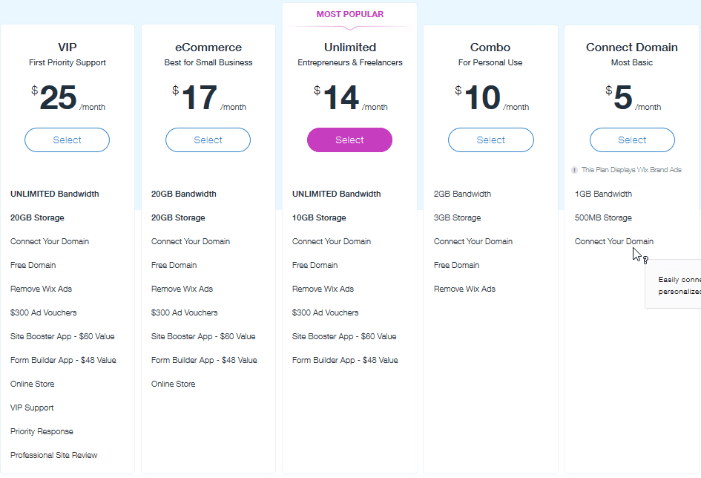 The free or cheapest plan (connect domain) are good choices for personal or very basic sites. For a business website, I’d recommend the Combo plan (10/month) which should be enough but you can always upgrade later on if you need to. If you intend to sell products, you’ll need the eCommerce plan at $17/month. Strikingly only has 3 plans to choose from and they are free, Limited, and Pro. The free and Limited plan ($8/month) is best for personal and basic websites. To remove the branding and unlock the rest of the features (including eCommerce) your only option is the Pro plan at $16/month. Both give you a free domain name e.g. yourcustomwebsite.com free for the first year with an annual plan (approx $20 value). A personalized email address to match your domain name with will set you back an additional $5/month with both Wix and Strikingly (annoying yet fairly common practice). Pricing summary: Wix offers more features on their lower priced plans and if you intend to sell online, there’s only a dollar difference between the two. 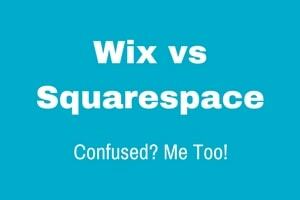 So, now we’ve reached the end of the comparison, who wins overall, Wix or Strikingly? Neither actually, at least I don’t think so and it depends on exactly what you’re looking for. On one hand, Wix has a plethora of design templates to help get you off to a flying start. They’re also jam-packed full of features making it a very versatile platform and the most suitable for heavier duty projects. Then we have Strikingly. Their main focus is to help you create a modern “slim-line” single page website which provides a better user experience for mobile users and they’ve designed their tools to suit. It’s a little easier to find your way around in the beginning and the support team is right behind you. Ready to get started? You can try Wix for free or create your free Strikingly account here. I’d love to hear about which one you choose and why so be sure to come back and let me know how you get on in the comments section below! You can start with Strikingly but eventually you may have to switch to Wix as your business grows. Right now, I am using both. The amount of features that Wix has is amazing. However Strikingly is easier to use; it’s primarily for someone that needs a one page website. You’ve summed up this whole comparison in just a couple of sentences. I couldn’t agree more. Strikingly is easier to get the hang of and dare I say it, fun to use. But that is down to it being an overall simpler platform than Wix and one which offers less features and customization options. Strikingly for basic single page sites and Wix for larger projects.